My Boxer Dog Training started when my beautiful canine was only a pup. My pet stole my heart as soon as I saw her and I instantly knew she was my pick of that litter. With a recently purchased new home, I was a bit weary of what may lay ahead for us. Having the virtue of patience, I reassured myself that everything was going to be perfect. Before bringing this marvelous and lively creature into my home, thorough research About Boxer Dogs had been completed. My vet had given me a wealth of knowledge and encouraged me to go online to read on the Boxer Dog Breed. In the following, you will find some tips and suggestions about different aspects of Boxer dog training. You should always keep in mind that any Boxer that is less than six months old has not yet developed fully. They cannot hold their bladder or feces. You will need to monitor the puppy’s potty pattern. With careful monitoring, you may be able to establish a schedule. You can then place your pup on a leash and take her to a particular area at this time. This process may have to be repeated many times until your dog begins do so on her own. With my Boxer, I found that scheduling her feedings and drink worked well. She was also taken outdoors for potty breaks after drinking, feeding, exercise and even play. This aided her in becoming used to a pattern or schedule. Two hours before bedtime, my boxer was not given anything to drink. My vet had informed me that this was an excellent method to learn bladder control to a pup. My Boxer seemed to learn quickly and easily. 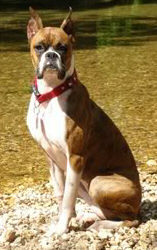 Many dog owners use crates or play pens to help in boxer dog training. This ensures that the pup remains in a secure area when no one is monitoring her. Some dogs only frequently have accidents. You should check with your vet to make sure that the pup does not have some sort of Boxer Dog Health concern. Other canines may urinate when excited. They often become agitated and over anxious when guests come into the home. If you know you are having guests, you should try taking your dog out for a period of play in order to help in relaxation. All experts agree that Boxer Dog Training should start around the age of six weeks old. Earlier Training is often easier and aids in their socialization skills. Boxers are a very energetic and playful breed. They require extensive attention from their owners and if like my pet, love to be trained. Spend Time with Your Dog and you will find that training is a breeze. You should also instill commands and obedience. Try basic commands such as come, sit, and stay or down. Once your dog has mastered these few basic commands, you will be able to start on new ones. Never overload your dog with too many commands at one time. This may agitate and confuse your pet. Remember to always use a calm voice as well. As a final thought, try rewarding your dog for good behavior or an obeyed command. Good Luck!